The transport sector of Bangladesh consists of a variety of modes. As the country is essentially a flat plain all three modes of surface transport, i.e. road, railway and water, are widely used in carrying both passengers and cargo. The airline network is also extensive and effective. In Bangladesh, among the various modes of transport, road transport system has been playing a significant role in transporting passengers and goods. The Roads and Highways Department (RHD) manage several categories of road. RHD has total length of 20,948 Km road unders its control. RHD also control a total number of 4,659 bridges and 6,122 culverts. RHD are currently operating about 161 ferry boats in 81 crossings (13 on national highways, 11 on regional highways and 57 on feeder roads) on its road network throughout the country. As of January 2010, Local Government Engineering Department (LGED) has so far constructed a total of 133,514 km (64,691 km dirt road and 68,823 km paved roads) upazila and union roads and 971,498 bridges/culverts. The 4.8 km long Bangabandhu Bridge, which was opened to traffic in 1998, is the eleventh longest in the world. It has established a strategic link between the East and the West of Bangladesh. It is generating multifaceted benefits to the people and promoting inter-regional trade. Apart from quick movement of goods and passenger traffic, it is facilitating transmission of electricity and natural gas and has integrated the telecommunication links. The Civil Aviation Authority is a public sector entity entrusted to construct, maintain and supervise airports and regulate air traffic. The national flag carrier Biman flies to 26 international and eight domestic destinations. There are now 13 operational airports and Short Take-off and Landing (STOL) ports in Bangladesh. These are Dhaka, Barisal, Chittagong, Comilla, Cox’s Bazar, Ishurdi, Jessore, Rajshahi, Syedpur, Sylhet and Thakurgaon. Of these, the airports at Dhaka, Chittagong and Sylhet serve international routes. Air cargo and STOL services have been handed over to the private sector by the government. The Bangladesh Railway provides an efficient service to places of interest such as Chittagong, Sylhet, Khulna, Mymensingh, Bogra, Rajshahi, Dinajpuir starting from Dhaka. The inter-city Express Service is available to and from important cities at cheap fares. 659.33 km, Dual Gauge 374.83 km and Meter Gauge-1,800.88 km) and a total of 440 stations at the end of the year 2008-2009. 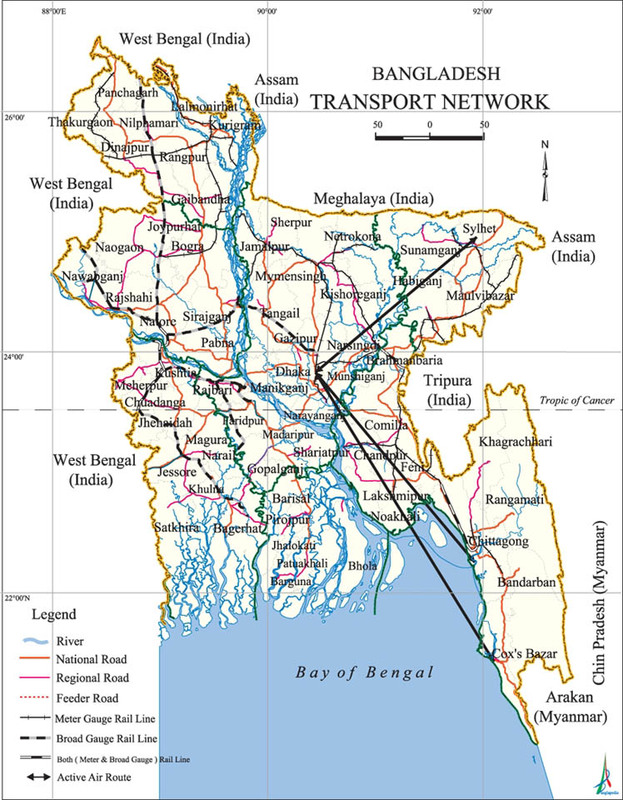 Train services between Dhaka-Kolkata have been commenced on 14 April 2008 in order to establish communication between Bangladesh and India. After inclusion of railway track over the Jamuna Bridge, railway link between east and west zone has been established. Country made crafts are the most widely used carriers on the rivers. These carry passengers and merchandise on a large scale. The landscape of Bangladesh is dominated by about 250 major rivers which flow essentially north-south. The alluvial flood plain formed by these rivers covers most of the country. Wherever there is a river and a village, a launch or steamer will ply for trade. Bangladesh Inland Water Transport Authority (BIWTA) has been established by the government for maintenance of navigability of ports and channels while the state-owned BIWTC provides passenger and cargo services in inland waterways and coastal areas of the country.